In this chapter we solve similar problems. We know that 2+3 =3+2 and 2*3 =3*2. Thus addition and multiplication are commutative. Similarly (2+3)+4= 2+(3+4) and (2*3)*4= 2*(3*4). Thus addition and multiplication are associative. The number of elements in a set A is called ‘cardinal number’ of the set and is denoted by n(A). 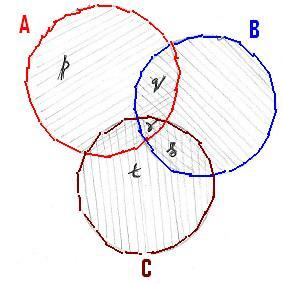 ( n(A B)=0 as A B is a null set when A and B are disjoint sets). 3.3.2 Problem 1: A florist has certain number of garlands. 110 garlands have Champak flowers in the garlands, 50 garlands have jasmine flowers in the garlands and 30 garlands have both the flowers in them. Find the total number of garlands he has. Let A be the set having garlands having Champak, therefore n(A) =110. Let B be the set of garlands having Jasmine, therefore n(B)= 50. A B is the set of garlands which has both these flowers. Therefore n(A B)=30. A B is the set of garlands the florist has. Therefore the florist has 130 garlands. 3.3.2 Problem 2: A class has 60 students. Every one should choose to be in Kabadi team or hockey team or in both the teams. If 45 students chose to be in Kabadi team and 30 students chose to be in Hockey team, how many are in both the teams? A B is the set of students who are in both the teams. We are asked to find n(A B). 15 students have taken both Mathematics and Science. 3.3.2 Problem 3 :A TV viewer ship survey was conducted by an agency. They conducted a survey on a sample of 1000 families in a place. They found that 750 families viewed News channel, 400 families viewed sports channel and 300 Families viewed both channels. 1. How many families viewed News channel only? 2. How many families viewed Sports channel only? 3. How many families viewed neither of the channels? 1. A-A B is the set of families who see only News channel and its numbers is n [A-A B]. 2. B- A B is the set of families who see only Sports channel and its numbers is n [B-A B]. Let us assume that you have been given the following question in an examination for matching. From examination point of view there can only be three right matches. However, as it can be seen from the figure (Every elements in set A is paired with every element in set B), we have 12 possible pairs. Thus we have in all 4*3 = 12 possible pairs. If A and B are two given sets, the set containing all the ordered pairs where the first element is taken from A and the second element taken from B is called ‘Cartesian product’ of two sets. The resulting set is denoted by A B (read as A cross B). 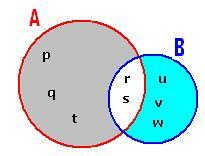 Some times when we have an ordered pair, it is possible to have a relationship between elements of two sets. 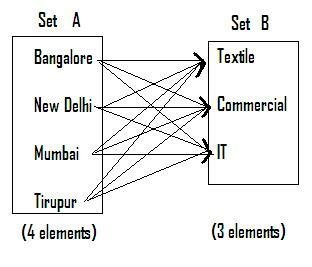 Some of these relations are =, <,>, ||. We can have a relationship called ‘state’s capital is’. Note that (Bihar, Patna) (Patna, Bihar) as the relationship changes from ‘State’s capital is’ to ‘is capital of the state’.